Appearing as the first release this year, the United States Mint is set to debut one of its most popular annual numismatic products with today’s 12:00 noon ET launch of the 2018-W Proof American Silver Eagle. 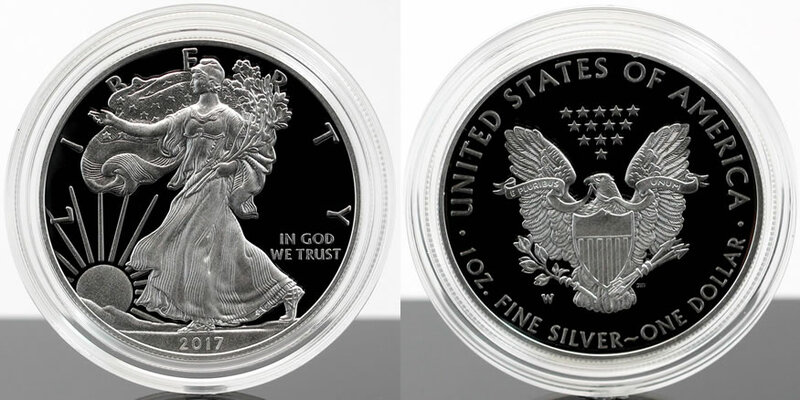 2018-W Proof American Silver Eagle (images of its obverse and reverse). Coin obverses (heads side) showcase Adolph A. Weinman’s “Walking Liberty” design. It first appeared on 1916 to 1947 half dollars. LIBERTY is inscribed above with IN GOD WE TRUST to the right. The coin’s date of issue is seen at bottom. Each reverse (tails side) portrays John Mercanti’s heraldic eagle with shield design. UNITED STATES OF AMERICA, 1 OZ. FINE SILVER and ONE DOLLAR are inscribed around the eagle. The proof coin is produced for collectors and continues an annual series which started in 1986, making this release the 32nd in the program. There is no denying that collectors have a soft spot for American Silver Eagles. This may be due to its annual nature, its silver content, its subject matter, or perhaps just the fact that many have always purchased the coin and continue to do so. Right out of the gate, this year’s issue is expected to attain first-day sales of around two hundred thousand. Last year found collectors snatching up 226,173 coins on release day, March 23, 2017. This ended up accounting for the lion’s share of sales in 2017 with 366,284 individually claimed through Dec. 31. This CoinNews photo shows the obverse and reverse side of a 2017-W Proof American Silver Eagle. Individual sales of the silver coin through Dec. 31 total 369,356. 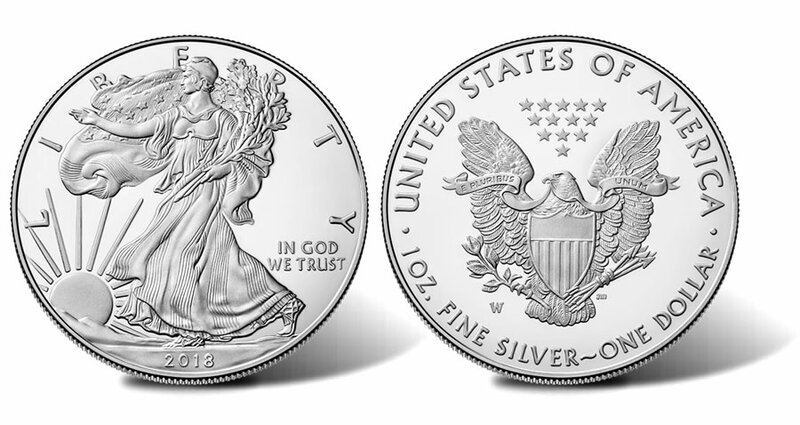 Since their inaugural release, American Silver Eagles have retained the same basic specifications and designs. This includes a composition of 1 ounce of 99.9% pure silver, a weight of 31.103 grams and a diameter of 1.598 inches (40.60 mm). Each bears a collectible proof finish described as having sharp frosted design elements set against a mirror-like background. A ‘W’ mint mark on the coin’s reverse identifies its production at the U.S. Mint’s facility in West Point. Targeted for a summertime release, the U.S. Mint will also issue a proof Silver Eagle from the San Francisco Mint which carries a ‘S’ mint mark. Similar specifications and designs are found on related uncirculated and bullion American Silver Eagles. 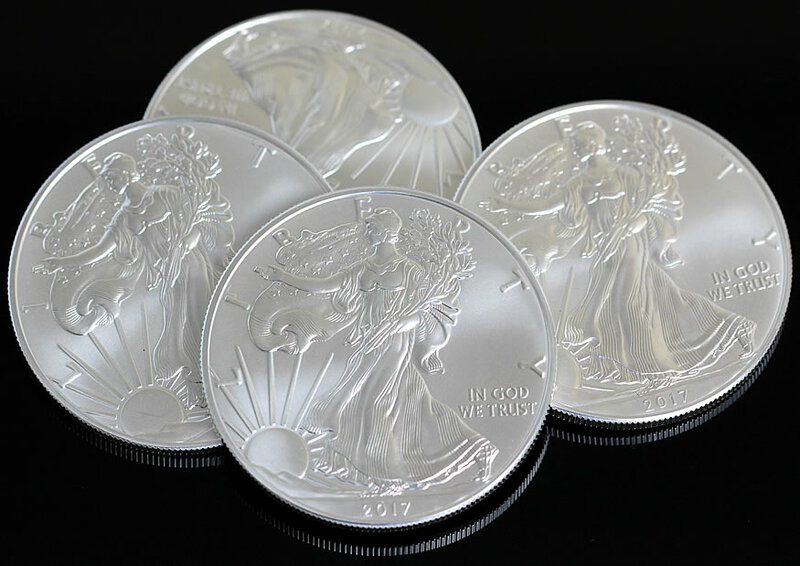 CoinNews photo of investor-grade 2017 American Eagle Silver Bullion Coins. Unlike the collector proof editions, the U.S. Mint does not sell their bullion coins directly to the public. They are generally available from bullion and coin dealers for a small premium above their melt value. These coins also lack a mint mark. Over 18 million of the bullion variety sold last year, while nearly 140,000 of the 2017-dated uncirculated Silver Eagles have sold to date. Order 2018-W Proof American Silver Eagles directly from the U.S. Mint by visiting its product page or by calling 1-800-USA-MINT (872-6468). The collectible is priced at $55.95, which is $2 more than the still-for-sale 2016- and 2017-dated issues. 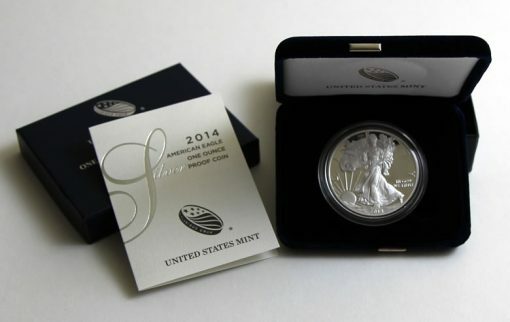 For years, as shown in this CoinNews photo from 2014, proof American Silver Eagles have been individually encapsulated, placed inside a blue velvet, satin-lined presentation case, and ship with a Certificate of Authenticity. Notice the proof finish, giving the coin a mirror-like quality. Coins ship in a blue velvet, satin-lined presentation case and are accompanied by a United States Mint Certificate of Authenticity. Thank goodness they didn’t change the design of either obverse or reverse for this coin! Annual change have more advantages. Why U.S. Mint didn’t make lunar coin. Even though the mint raised the price from last year – it looks like I received free shipping on my single order – the usual 4.95 shipping fee isn’t listed on the mint order summary page. Hopefully this will hold true for all of my mint enrollments this year! Last year I cancelled most of my enrollments so that I could combine shipping when the different offerings were released close together. It would be nice if they put a simple ”privy*mark” on one of the 3 sometimes 5 *American Silver Eagles the mint offers every year, there’s plenty of room to stamp one on. I bought a handful of the ”big foot privy” on the Maple Leaf, 9999.raw for pretty much the same price as the 999.3 *ASE bullion coin, + big foot had a much lower mintage than the *eagle that year, they moved pretty quick. To me a privy mark only clutters up an otherwise clean image on a coin. I’m glad the US Mint hasn’t stooped that low with regards to the silver eagle. I hope they never change the design of this beauty. As a Canadian and avid numismatist, I have many American coins in my collection. The silver eagle, Mercury dime and American Buffalo are my favorites with truly ageless designs. They never need to be modified or changed for any reason in my opinion. Perfect balance between art and currency. They will always be in my collection. Just received my order today. Only four coins to split with a friend. Hoping they look ok. Seems there have been quality issues lately. It was nice to have free shipping but was not happy with the price increase. Not sure how much longer I will be a mint customer. This may be my last subscription. Good luck to all and hoping that we all get superb quality eagles. A meaningful ”1” year only privy mark on the *ASE bullion coin would go over very well, a 3/16” privy would look good on the *shield in the middle just above the six strips. The ASE Proof is a beautiful coin, but it has been offered in just about every conceivable variation over it’s 32 years…Ironically one of you is Canadian and like the coin as it is…I have turned to some of the Royal Canadian Mint’s just for some variety…(Koala, kookaburra, panda also appealing)…In fact all of the American coinage is getting boring as evidenced by the drop in the values of many recent mint & proof sets…even the much touted 2017 enhanced set is languishing & is being bought at below issue price…look at many of the recent slabbed ASE’s selling for below price guide.how many Cases has Mercanti signed? Not really a rarity anymore…how big of a premium do you want to pay for a signed coin?? Has anyone found any errors in the BU tubes?